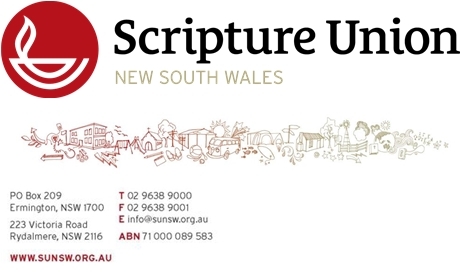 Thanks for your application to volunteer to be a part of a ministry of Scripture Union. To be accepted as a volunteer you will need to complete this application and provide us with essential information including, if 18 or older, your Working With Children check details. We will advise you of the outcome of your application once we have undertaken the necessary screening. There are five pages to this form and will take you around 20 minutes to complete. Having your NSW Working with Children Check details with you will save having to provide these later. If you have completed Child Protection/Safe Ministry Training have these details ready too. If you have any problems with the form contact the SU Office. Is there an anaphylaxis / allergic reaction action plan for any allergies listed? This section is used for any family members under 18 who will be accompanying the Volunteer. Other adult volunteers are required to submit a separate application. Do you wish to register accompanying family members under 18 years of age? Do you want to another email addresses? Please enter mobile phone in format #### ### ###. Please enter phone in format ## #### ####, including area code. Do you want to add another address? The names and details of at least TWO referees is required. In providing the following details you authorise SU to contact my referees and any relevant authorities regarding character, experience and information provided in this form. A valid WWCC clearance is required for any volunteer who is 18 years of age or older at the time of the activity. If you do not have a valid WWCC application can be started at https://wwccheck.ccyp.nsw.gov.au/Applicants/Application. Volunteers are required to complete suitable safe ministry / child protection training. If already completed through church or ChildSafe online provide details here. Is this application for leadership of a School lunchtime group (eg ISCF, SUPA Club? Q1. What is a Christian? Q2. Are you a Christian, and if so, describe how you became a Christian? Q3. How does being a Christian affect your daily life? Q4. What experience do you have working with children? Q5. What experience do you have leading in a Christian ministry context? Q6. What, if any, past involvement have you had with Scripture Union? Q7. Why do you want to be a volunteer with SU and particularly for the activity for which you have applied? The following questions are for you to provide details of licences, qualifications, skills and interests relating to the activity you are volunteering for. Add as many as you like. If you cannot recall the exact date, it is sufficient to simply enter 1 January of the year your qualification was awarded. Date format would be 01/01/####. Outline any practical experience or skills you have that will help on the SU Activity that you're applying to be part of (eg Art, Photography , Video)? My signature or FULL NAME TYPED in the space below indicates my willingness to permit my child / children to fully participate in all Scripture Union associated activities. In the case of a medical emergency I give permission to Scripture Union to attain medical assistance for my child / children. I understand that every effort will be made to contact me prior to initiating such. Scripture Union is a ChildSafe organisation. Details of our policies are available upon request. I confirm that the information provided on this form is true and accurate. I have read the SU Aims, Beliefs and Working Principles and agree to work under them. The SU Aims Beliefs and Working Principles can be found here. On clicking submit, below, you will be taken to an e-signature page, given opportunity to review your answers and then to electronically sign your application. The e-signature will require you to access your email for verification.